Rough and ready setups really tend to catch my fancy. Don't be me wrong, I enjoy finely detailed, well crafted cycling art. I can spend way too long looking at the delicate thinning of a Brian Baylis' finished lug at a bicycle show. But when you see a bike that gets used a lot, and can tell in a myriad of ways how it's been adapted to the specific use of its owner, that resonates with me. 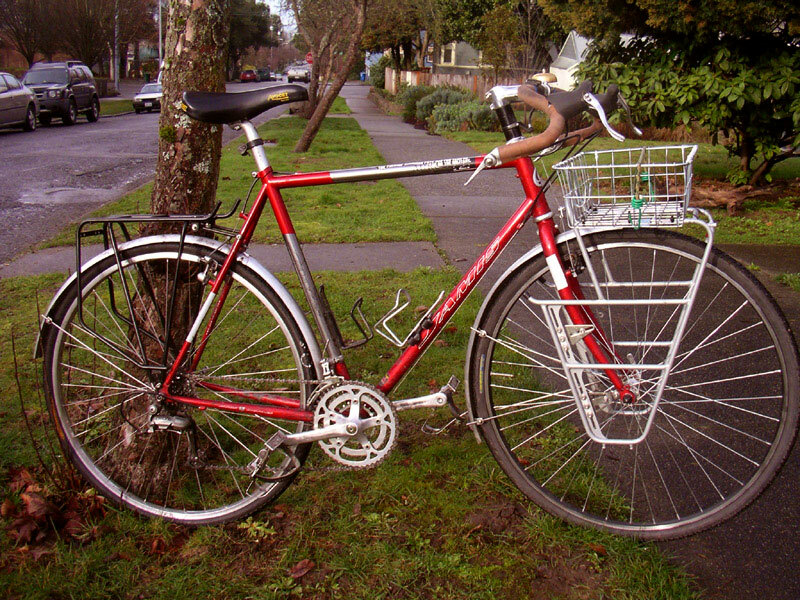 It's not a terribly expensive frameset, and it lacks the lugwork that so many bicycles are using. But, I really appreciate the build. The basket set up on the front rack, the simple, proven components in the drivetrain, the mis-matched water bottle cages. I also really like the very real image of his drivetrain. As he says in his description, it's a bike that will let him go where ever he wishes, whenever he wants. And wasn't that the whole promise of the bicycle to begin with?